When my family and I left town last week to spend Christmas with our two families, the last thing I expected was to come home with a new recipe to share. I’d signed off on Facebook for the holidays and didn’t even bring a camera with me. My plan was to make only tried and tested recipes for Christmas Day (and as few of them possible—I was on vacation, darnit! 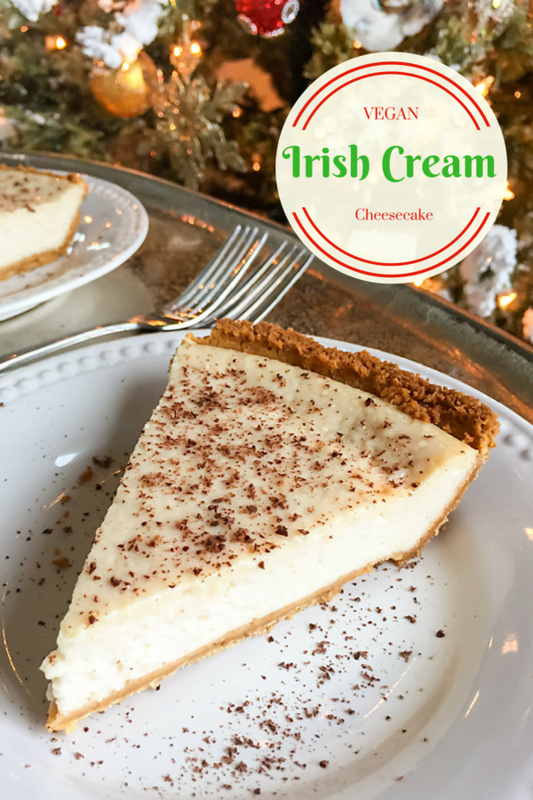 ), but when we couldn’t find vegan eggnog in any store, Vegan Eggnog Cheesecake had to become Vegan Irish Cream Cheesecake. Who could have guessed that it would be hard to find vegan eggnog in New Orleans? In the days leading up to Christmas, we looked in 3 different grocery stores, including Whole Foods, without any luck. In one of those stores, I bought a bottle of Bailey’s Almande, which I’d heard through internet chatter was the new vegan, gluten-free version of Irish cream. I wasn’t planning to cook with it—I just wanted to try it. It’s been decades since I had Irish Cream, and I was curious to taste it again. 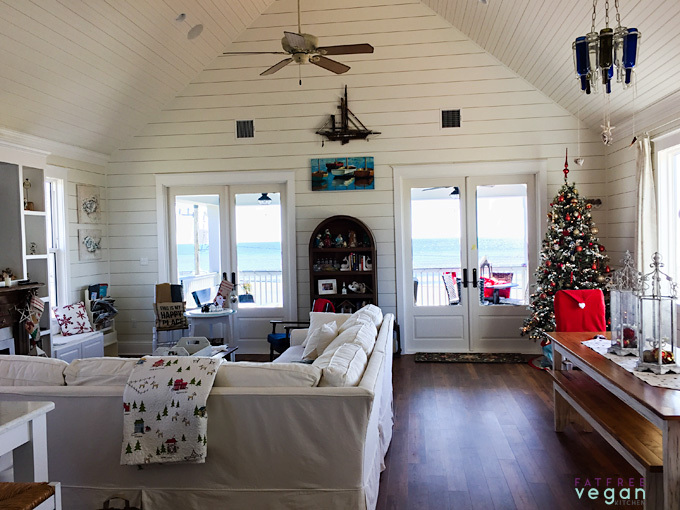 After spending Christmas Eve with my in-laws in New Orleans, we drove to the Mississippi Gulf coast to spend the next few days with my family in a beautiful rental house overlooking the beach. We barely had time to unpack the car before we had to start cooking Christmas dinner and dessert. 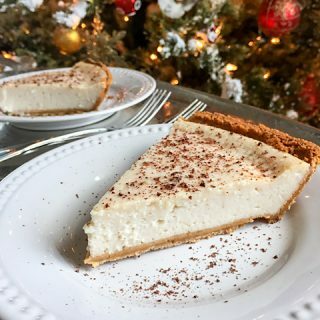 I hadn’t given up on making the eggnog cheesecake—I’d decided to begin by making a vegan nog and use that in the cheesecake. But once I was surrounded by family and beautiful beach views, I didn’t feel like spending any extra time in the kitchen. Then the idea of using the Almande came to me, and the rest is history. Now, before the Health Police chime in, I know that even vegan Irish Cream is not a health food. I’m aware that it has sugar, alcohol, and fat (it’s made from almonds). I’m also aware that the cheesecake I made from it is full of processed food and is not suitable for any Whole Foods Plant Based diet. 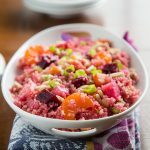 I consider it a party food, something you make for celebrating with friends and family once a year (or however often you like because I am not the Health Police, either.) It is not fat-free. So how did it come out? 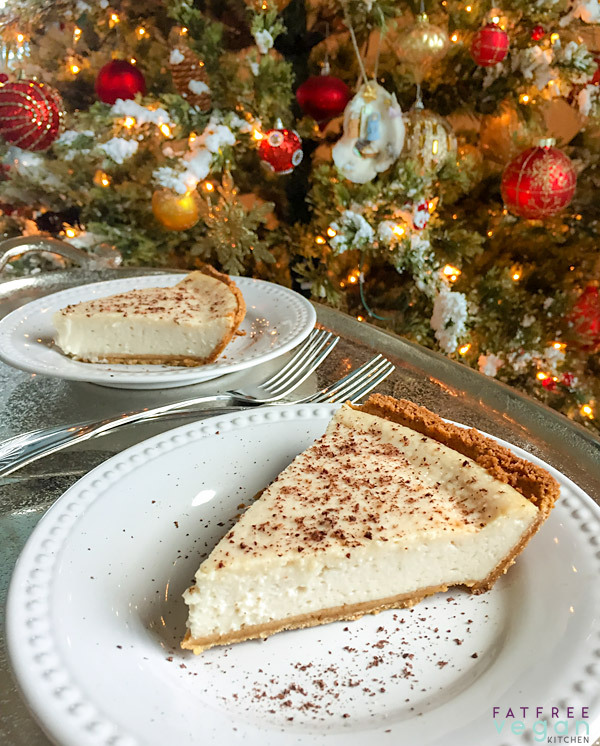 Super-rich and flavorful, even more so than the eggnog version. After originally cutting “normal” sized slices, I had to go back and cut them in half because of its richness. It was so good that I knew I had to share it with you, so I used my phone to take the photos in front of the beautiful Christmas tree the owner of the home had set up for us. I probably could have cut the sugar back to half a cup, but I didn’t want to take any chances with our only vegan dessert. All in all, it was a great success, and the only thing stopping me from making it a Christmas or New Year’s tradition is the cost—Bailey’s Almande is several times more expensive than eggnog. 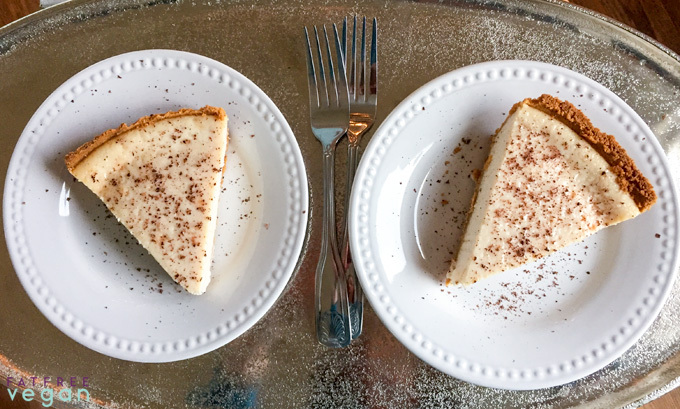 If you want to attempt to make a healthier vegan Irish Cream Cheesecake, I suggest substituting an almond-based cream cheese, such as Kite Hill, for the Tofutti. I would also increase the cornstarch by a tablespoon just to make sure it sets. This also applies if you use any silken tofu other than Mori-Nu. Please, if you make any substitutions, test the recipe before you plan to bring it to any party or event. Because I’ve made it only as written below, I can’t promise good results if you make any changes. Serve this rich cheesecake in a graham cracker crust or use my Oatmeal Cookie Crust. Preheat the oven to 350 F. Drain the tofu and put it and all ingredients except pie crust and chocolate into your food processor. Blend until completely smooth. Pour into a prepared pie crust and bake in the middle of the oven for about 55 minutes (do not allow to brown). Filling will be slightly jiggly, not completely set until chilled. Remove from oven and allow to cool. Refrigerate until completely chilled (the longer, the better). Serve sprinkled with grated chocolate if desired. The nutritional info does not include the crust. 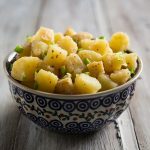 If you want to attempt to make this a little healthier, I suggest substituting an almond-based cream cheese, such as Kite Hill, for the Tofutti. I would also increase the cornstarch by a tablespoon just to make sure it sets. This also applies if you use any silken tofu other than Mori-Nu. Please, if you make any substitutions, test the recipe before you plan to bring it to any party or event. Because I've made it only as written, I can't promise good results if you make any changes. I wish you all a very Happy New Year! Please start it off right with some black-eyed peas and greens! I have not been compensated in any way by Bailey’s, Tofutti, or any other brand. Links to Amazon are affiliate links, and I may receive a few pennies on the dollar if you buy through them. Thank you for your support! Happy New Year Susan! I had never heard of this Bailey’s Almande–sounds like a great substitute for regular Bailey’s when us vegans need a decadent holiday treat! I may try to find that one of these holidays and play with it–and maybe take a nip or two in the process! 🙂 Glad all is well despite the calamities and requirements–same at this end. Love and health and blessings to you and yours in the new year! thank you for posting such an amazing dessert to try. we just had the Baileys a few weeks ago, it’s amazing. And we loved the house rental you listed. Part of my “hobby” is shopping VRBO for the best rentals. I just love searching through and looking at all the beautiful pictures! Happy New Year to you! It’s not just down there…. no one was carrying the Silk Nog this year. I’m not sure if there are any other brands or not, but there was none to be had. My husband bought some kind of nog—-coconut, I think—-here in Jackson. I didn’t look for it before we left town, so I didn’t know it was going to be so scarce. Hi Susan, just wanted to share with you something new I learned about. Never heard of it before, maybe you haven’t either. Vanilla Paste. They said it takes vanilla flavoring up a notch. So if you never heard of it, you might like it. Thanks, Linda. I’ve heard of it but never tried it. I’ll have to look for it. We had trouble finding vegan nog here too just before Christmas, all of the stores were sold out. Which is great I guess! Oh my, that beach house looks like heaven! And this recipe looks great for celebrating, thanks! I got really excited when I saw this recipe… I’d have to search for the bailies Almande.. but the idea of a creamy rich pie was so very tempting… I have become intolerant to dairy products and tend to search for almond or coconut milk recipes… I came to a screeching halt when I saw the tofu… Can’t do soy/soya at all… Is there any way to make a creamy pie or desert without the soy? You could try using an equivalent amount of pureed cooked cauliflower. A vegan creamcheese? Oh I love you! I can’t wait to try this myself, must be delicious! 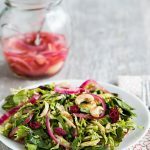 I know this is not fat-free but I really want to make this for the weekend brunch! The cheesecake looks so rich and creamy, definitely trying this on my own before taking it to the brunch, though. Thak you Susan for this vegan recipe! This isn’t a comment about the Irish Cream Cheesecake (which does look absolutely delicious, but I always fix the layered pumpkin cheesecake). Instead I have a request. I remember that on a couple of occasions, you’ve posted a recipe that “duplicates” something made by Amy’s (like the Samosa wrap and one of the salad dressings). My request is for her scrambled tofu recipe. 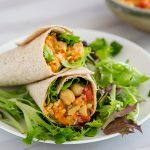 I’m not a fan of any scrambled tofu recipe I’ve tried — they’re either way too spicy for breakfast, or they aren’t flavorful enough to mask the taste of the tofu. The only one I like is Amy’s — it has spinach, mushrooms, zucchini, carrots, and onions (maybe more stuff too) and 3 or 4 tomato slices that I always stir into the scramble after it cooks. It’s really scrumptious — but I have failed every single time I’ve tried to make it. Can you help? I haven’t had it, so give me a chance to buy one and try it out, and i’ll See what I can do. I have a standard way I make scrambled tofu that might not be far off fro Amy’s recipe. I made this for Easter with Mori Nu Firm tofu (couldn’t find extra firm! ), Daiya plain cream cheese and 1/2 cup sugar. It was absolutely delicious and I’m making it again as I type for another party. Thank you!! I was hoping you could help me adjust the baking time for making these in cupcake pans. Thanks! I would start checking them for doneness after 20 minutes. Just check every 5 minutes until they’re set. I’d love to know how they come out! This recipe is superb. On first bite the Bailey’s taste stood out followed with a lush creamy cheesecake flavor finishing it off. Some of the non-vegans in the house agreed this was delicious. I’ve tucked this recipe away to make again for a special day.